Jeff Samardzija is now a mainstay for the Cubs staff. As the dust settles from all the wheeling and dealing by the Cubs, the team is now moving forward with a different pitching rotation. One player the team’s front office wanted to remain part of the fold is 27-year-old Jeff Samardzija. Reaching the big leagues, mostly out of the bullpen, had been a difficult task for Samardzija. This season he remained with the parent club after proving himself as a solid starter that still has some room to grow. He did endure a personal six-game losing streak in June but has settled down, last week throwing a one-hit pitching gem against Pittsburgh, and had a no-decision on Saturday versus the Cardinals. At 6’5” Samardzija has a commanding presence on the pitching mound and continues to work on his large assortment of pitches. When he first joined the Cubs he relied on his fast ball and splitter and thought he could get away with it. He&apos;s learned that&apos;s not the case. “Eventually things catch up with you in the scouting reports and you have to evolve as a pitcher and learn to get better,” he said. Now he has as many as seven different pitches in his arsenal but manager Dale Sveum wants him to concentrate on three of them. At the University of Notre Dame, he was a stand-out receiver for the renowned football team. He also was a dominating pitcher for the baseball program. Former Cubs General Manager Jim Hendry selected Samardzija in the 5th round of the 2006 amateur draft. He was given a seven-year deal with a huge signing bonus. Life in baseball has not been an easy task for the Valparaiso, Ind., native — until now. This season with the Cubs new management, Samardzija was told from the beginning of the season he would be made into a starter and is an important part of this team. "They told me I was going to be a key part of this team, that’s what I wanted to hear," said Samardzija. Cubs’ manager Dale Sveum has shown patience with the big right-hander. “The learning process of starting pitching is to be yourself, don’t try to be someone else, don’t create stuff,” said Sveum. 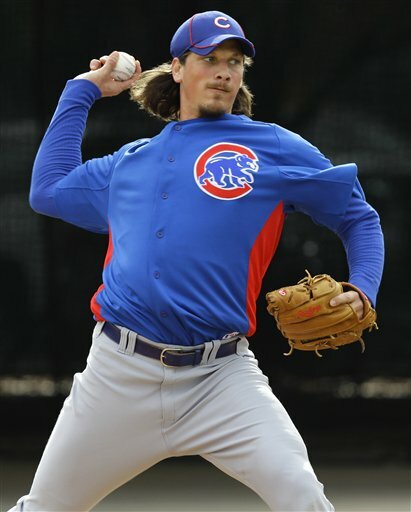 The Cubs coaching staff is being very cautious with Samardzija since he is getting extended in his starting role. “We’re trying to keep the innings and pitch counts down, he is in unchartered waters right now,” said Sveum. Jeff appreciates that the Cubs have been mindful of the newness of this position and trusts how he is being handled. He also wants to do well for the people that took a chance on him, most notably, Jim Hendry and Hendry’s assistant, Randy Bush (who is still with the team).”They put a lot into me to be good,” said Samardzija. Now with a new staff and management group he feels like he is building on his foundation and now has more confidence. It didn’t seem possible just a few years ago, but Samardzija appears to be one of the anchors of the Cubs&apos; pitching staff. Of course, with players like Ryan Dempster and Paul Maholm gone he will have to shoulder some of the load.